Valet parking services instantly add a sense of sophistication and class. You can maintain an organized parking system while enhancing your guests experience with professional valets. Check these crucial elements to make sure you’re choosing the right Atlanta valet parking service for your needs. Always look for valet parking companies with a long history in the business. If they have experience managing parking operations similar to your location, that’s a must. During the proposal process, valet companies should always offer a free site visit to ensure they are fully aware of all potential variables. The vendor can easily demonstrate their experience with valet parking services during this visit. They should clearly explain how they plan to manage traffic, parking, and overall organization of your event or long term parking operation. You should expect a detailed proposal or quote for your requested valet parking services. Ensure all details are included in writing and make sure this includes a staffing model and exact parking times. For events, don’t forget to schedule your valet staff a minimum 30 min prior to the event start time. There shouldn’t be any mysterious, unexplained fees tacked on to your final price. Everything should be transparent, itemized, and discussed in advance. While you don’t want to overpay for these services, be wary of companies with extremely low rates. You’ll find that the cheapest valet companies are the cheapest for a reason. A poorly managed and unskilled staff can spell disaster for you. At the end of the day, cheaper is never better when it comes to valet. Recommendations and referrals are some of the best resources for choosing a valet parking company. Ask for references with contact information to be included in the proposal you receive. Feel free to ask for a detailed client list to ensure the company you are evaluating has experience that suits your needs. Check online reviews and BBB ratings for your top picks. While it’s inevitable for a few negative reviews to pop up, you should avoid companies with a clear pattern of unprofessional behavior. Accidents and other instances of liability are a major hazard when you’re dealing with valet parking services. Make sure your valet parking company is fully insured. In addition, confirm that they have GKLL coverage on their policy. The best companies also carry an umbrella policy that offers at least $1 million in liability coverage. Find out what technology your valet company employs to manage their parking operations. Many companies have moved beyond the paper ticket approach, using sleek streamlined apps instead. Smart technology solutions can help eliminate issues with lost tickets and human error. Well-implemented valet technology also can reduce wait times and create a generally better user experience for your guests. At National Parking, for example, we use SMS ticketless valet technology to ensure a virtually seamless valet parking experience. Take your time researching potential service providers to make sure your Atlanta valet parking service provides the quality and convenience you need for your valet parking need. 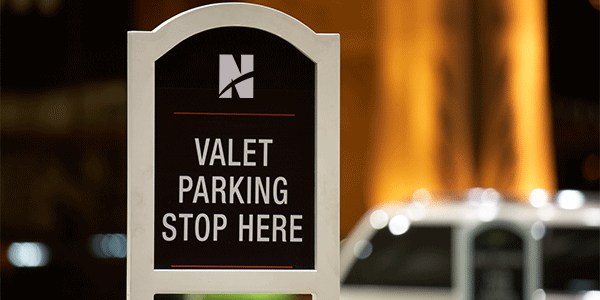 At National Parking, we pride ourselves in being Atlanta’s premier valet parking service provider. That means we have the experience, reputation, and technology to ensure the highest-quality valet parking experience for your needs. We also are fully insured, and we’ll work with you to create a custom proposal for your valet parking needs. Give us a call 678-356-4030 or request a proposal online, and we’ll get started on outlining your valet parking plan today.